A friend of mine recently hosted a Chef’s table named Messa at Niche lounge and bistro, which is located in M block, Connaught Place overlooking the Statesman house. With over 19 years of HR background, blogging came as a hobby to him and he started Mystic Foodie Mantra a few years back. For this event, he curated a special menu for food bloggers in Delhi. Not being a regular restaurant reviewer, I wasn’t sure what to expect. The food served to us did not just look beautiful, it was simply delectable and I was thoroughly surprised. 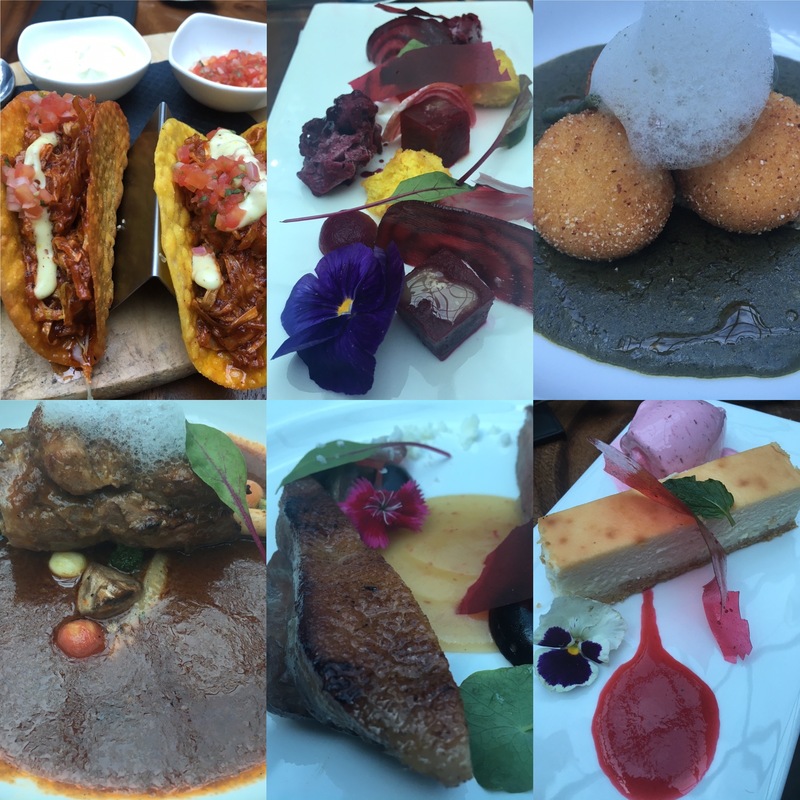 The evening began with amusing conversations complimented by an array of unique starters that included Pulled Kathal Tacos and 57 degree duck breast. Kathal, being an excellent substitute to meat, is one of my favourite vegetables, as I like the flavour and texture in it. Served with Salsa and Kasundhi cream, the crisp outer shell of tacos filled with shredded kathal made a perfect combination. The duck was cooked at 57 degrees by a French method named Sous-vide. Before, I go further about the tasting session, I must admit that the method of cooking involved a bit of food science. The chef revealed that the dishes on the menu are progressive. The cooking techniques involved are dynamic and always evolving. The chef also loves playing with textures, which was evident in the salad he prepared for us. The salad was made of beet and goat cheese. The beet in the salad took on various textures because of the intricate crafting by the chef. For the main course, we were served Hari Saag along with Polenta crusted fried yoghurt balls, corn bread and jaggery chips with white butter soil. In simple words, dahike kebab were served with the saag. But the imagination of the Chef was incredibly distinctive, which was evident by the preparation and presentation of the dishes made with simple ingredients. Next was the Lamb Shank Rogan Josh – Rogan josh gravy with ginger air and seasonal vegetables. This was the highlight of the Chefs table for me. It was delicious and I absolutely loved it. I did the most un-niche act at Niche. I slurped the shank and enjoyed the same to the core. Although, it was served as a complete dish in itself, I couldn’t resist myself from ordering assorted breads which went well with the Rogan josh gravy. The food journey ended on a sweet note with Cheesecake and raspberry sorbet which turned out to be the cherry on top for such a delightful evening.